Copenhagenize.com - Bicycle Urbanism by Design: Arrange a Svajerløb Cargo Bike Race! Arrange a Svajerløb Cargo Bike Race! 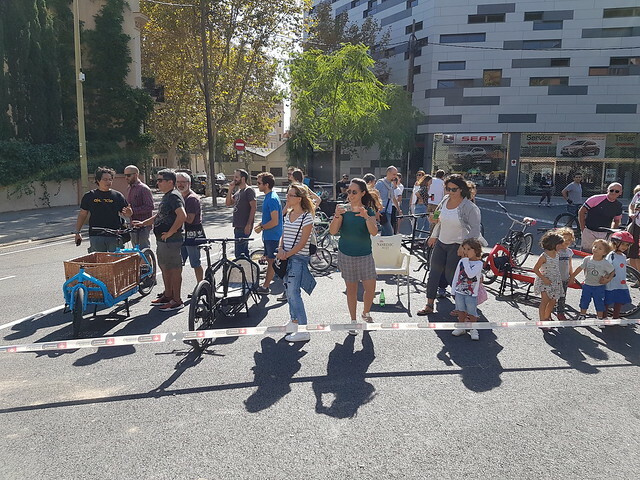 Last week in Barcelona, the inagural svajerløb cargo bike race was held on a sunny Sunday in the Poble Nou neighbourhood. It was event organised pro bono by Copenhagenize Design Co's office in Barcelona in collaboration with the Rueda International Bicycle Film Festival, where Mikael Colville-Andersen was president of the jury. Mikael and Jordi Gali from Copenhagenize whipped together a not-for-profit race and were thrilled at the turnout - both passionate particpants and curious spectactors. A 400 metre course was set up in the morning and there were particpants enough for 3 heats in the two-wheeled category, four cargo bikes in the three-wheeled and four teams in the team relay. The film, above, sums up the day nicely. For most of the 20th century in Copenhagen, a massive armada of cargo bikes were the backbone of transport in the city. A fantastic army of men and boys from the poor neighbourhoods made the city work. Men and boys who were also invisible in the social hierarchy. They were called svajere in Danish – or swayers if you translate it directly - because of the swaying motion of the huge, flatbed bikes when heavily laden. In 1942, a priest named Kristian Skjerring decided to change things for the better. He wanted to give these svajere a pedestal on which to stand. He organised what became known as a Svajerløb in the city – a cargo bike race for these bicycle messengers. He raised money through the races to send the young men to summer camps. They were the hardest working people in Copenhagen and Skjerring thought they deserved some respect. The races become incredibly popular in Copenhagen. Thousands came out to watch. There was prize money, but really it was about honour, and winning the right to call yourself the King of Copenhagen – at least until the next race. These Svajerløb races were held until 1960, when cars and vans started to dominate goods transport in the city. In 2009, the race was revived in Copenhagen and are now an annual event. The city has 40,000 cargo bikes in daily use, so a revival was a no-brainer. Unlike the 1940's, the cargo bike riders are now families and people with goods to transport. The Danish brand Larry vs Bullitt, who produce the Bullitt cargo bike, were behind resurrecting the races for the tradition, the fun and as an obvious platform to sell their product. While the event has developed a Red Bull feel to it - corporate marketing disguised as an event - there are race participants using many other cargo bike brands on race day. Cargo bike races are spreading fast, in tact with the rise of the cargo bike itself in cities around the world. There is now an International Cargo Bike Festival in Nijmegen, Netherlands each year. Apart from the recent race in Barcelona, we have registered on our radar races in Vancouver, Chicago, Paris, and Berlin, among others. In the Netherlands, family-friendly cargo bike events have taken place for many years. There is a new Facebook group called Svajerløb Global - The Cargo Bike Race Community - where people can share experiences and let others know about their upcoming races and share photos after they're done. So why not arrange a cargo bike race in your 'hood? Help raise awareness about the usefulness of cargo bikes and have a fun day doing it. Here are the basics to get you started. - Design a circuit in a loop (as opposed to an A to B course). There is no set length, but in our experience 400 meters seems to be a decent number. There should be some challenging turns, a slalom section and a straight, home stretch. If you have the chance to incorporate a hill, all the better. This ain't no Sunday bike ride, sunshine. Although think about the potential participants when you gauge the level of difficultly. In the Copenhagen version, there are many spandexy dudes among the participants and the course is usually designed for them and for speed. If you want your event to be more inclusive and aimed to drawing the curious as well as the experienced, create a course that is well-balanced. We've seen courses with an awkward patch of sand in the middle. Mix it up, if you want. Just keep it realistic and safe. - The stop and finish line should be the same and should be next to the loading zone, where the riders will load up their bikes - read more in The Rules, farther down. For the loading zone, you'll need some space for the riders in each heat to stop and where you can position the cargo they have to load. - If you can, design the circular course so that the spectators are primarily gathered around the stop/finish line and loading area but also so that they see the bikes on the course as much as possible. It helps maintain a level of energy if the spectactors can keep an eye on the race. - Depending on the width of the course you design, you can have between four and six riders in each heat or race. - You can use various barriersr to design the course. Plastic traffic cones or bollards, chairs connected with plastic tape, fences, you name it. Whatever you can get your hands on. We recommend using the original rules from the historical races in Copenhagen. The organisers of the annual race in Copenhagen these days stick to the same concept in order to maintain history and tradition, but also because the original rules are pretty cool. There are other cargo bike races at, for example, the bike messenger championships, but we'll stick with the historical rules here. - The race consists of four laps. The riders wait on their bikes at the start line. The first lap is ridden empty. They speed around the course and, upon arriving in the loading area, they load up their bikes with the cargo. This is the fun part, which is why spectators should be positioned close to the area. Then the riders head out on three laps fully laden, until they cross the finish line for the fourth time. - Depending on the number of participants, you can divide them up into heats. For example, the top two finishers can qualify for a semi-final or the final. Or top three. You'll figure it out. It's a hard race, so try to limit the maximum number of races an individual will race to three. - Cargo: In the traditional races in the 1940's, the cargo often consisted of car tires, newspaper bundles, empty, wooden beer crates and sandbags. 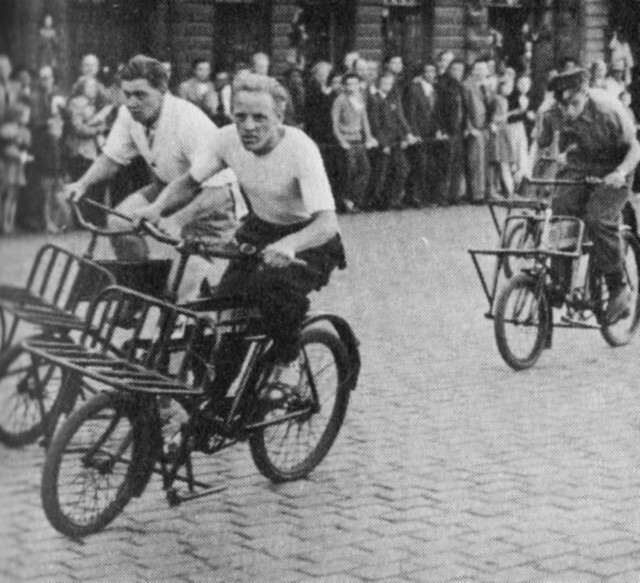 Cargo bike championships held in Paris in the 1920's and 1930's measured the weight of the cargo at 50 kg, although this was raised to 65 kg. Try to aim for between 35-50 kg as a rule of thumb. The cargo should not only be designed for weight. Make sure that you have items that oddly-shaped and difficult to secure to the bike. At the Barcelona race in October 2017, we had to be creative. Each rider had to load two plastic-wrapped bundles of water in 1 litre bottles (12 bottles in each), 5 kg bags of potatoes, another 3 litre bottle of water, a 5 kg bag of potting soil and a pack of 12 toilet paper rolls. We distributed the cargo to people after the race so we didn't waste anything. - Riders can use bungees or inner tubes to secure the cargo if they want. They can also carry an item in their hand. - After the bike is loaded and they head out on the last three laps, the cargo has to stay on the bike. If something falls off, the rider has to stop and pick it up, getting it back onto the bike before continuing. - Categories: traditionally speaking, there was a two-wheeler race, a three-wheeler race and a team relay. In modern versions, we've seen the addition of a women's category and a vintage bike category. In some cities, vintage cargo bike are hard to come by, so you can make the call about whether to have this category. If there are cargo bikes with an electric assist, you can create a category for them, if you like. Then there is the team relay. In this event, four riders share one bike. Each of them do one lap, four in all, just like the other races. When the first rider arrives in the loading area, the team members help to load the bike and the next rider gets on. It is permitted to help push the new rider into motion. - Spread out the races to allow for time between races. You can do all the heats for the two-wheelers, then move on to the three-wheelers and women's race and then get back to the semi-finals or finals. Traditionally, the team relay is the last race. In order to make the race even more family friendly, there can be side events with a parent cycling with a child in the box. You can created a separate course designed for finesse cycling and balance. The kids can be equipped with a stick and you can hang large rings up on thread. The parent cycles the bike close and the kid has to spear the ring with the stick, collecting as many rings as possible to win. Another idea is a cargo bike version of the egg race. A parent, with a kid in the box, has to cycle an obstacle course balancing an egg on a spoon. Or maybe the kid holds the spoon. Maybe both. Be creative. The race itself need not be an expensive affair. Sponsors are always handy, if you can get them. Try to make it an inclusive affair and invite as many cargo bike brands as possible - if not to race, then to exhibit their products in the interest of growing awareness of cargo bikes as solutions for urban living. Copenhagenize Design Co was involved in the cyclelogistics.eu project for three years and our partners arranged all manner of events with numerous cargo bikes to encourage citizens to try them out and get a feel for them, in cities around Europe. It really helps broadcast the message if people get to test them out. The more events around the world, the better!